Do you love gnocchi, but are terrified to try to make your own? 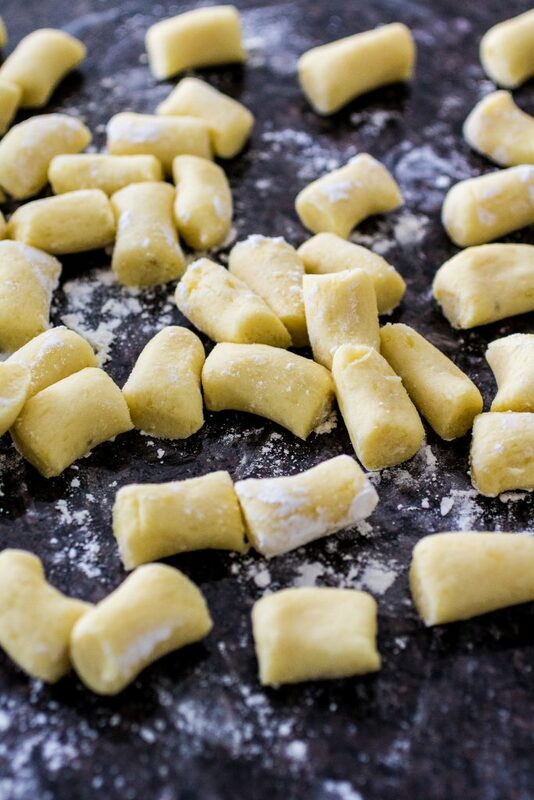 Take a deep breath and keep reading ’cause I’m gonna show you that making gnocchi is easy. 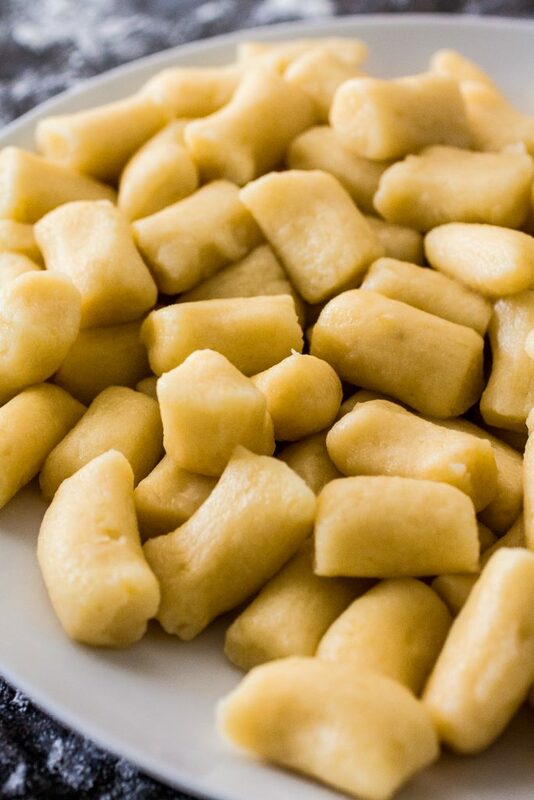 Who doesn’t love gnocchi? These delicious soft potato dumplings that go with pretty much any sauce you can think of. When made right, it is like biting into little pillows of heaven. But wait a second… “When made right”? That right there is the reason most people are intimidated by making gnocchi – or any homemade pasta, really – at home. Of course, some knowledge and technique go a long way and help you make pretty decent gnocchi, but the whole “making gnocchi at home is difficult” state of mind drives me nuts! Ok, your gnocchi may not be as pillowy as Mario Batali’s, but unless you’re cooking for a panel of Food Network judges, who’s gonna notice? My point is: ignore the snobs and just do it. Have fun! Get your kitchen all dirty and full of flour. 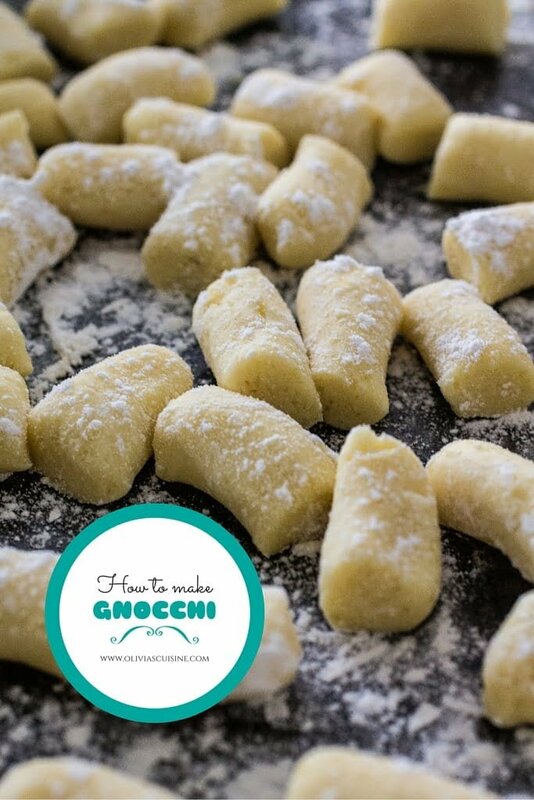 Maybe your gnocchi won’t be as perfect the first time, but practice will definitely get it there and soon you will be the gnocchi maker of your family. I’m in no way a pro. I didn’t go to culinary school and I’m not claiming my gnocchi could win a competition. But it’s pretty damn good gnocchi and my family and friends love it! It is pretty fluffy/pillowy and flavorful and I love making it, so I decided it was time to share it with you guys. I also have a – spoiler alert! – Gnocchi with Creamy Asiago Sauce recipe coming to the blog tomorrow, so I thought we should get the whole “how to make gnocchi” part out of the way so we can then focus on the delicious cheese sauce. Honestly, any kind of potato will do. 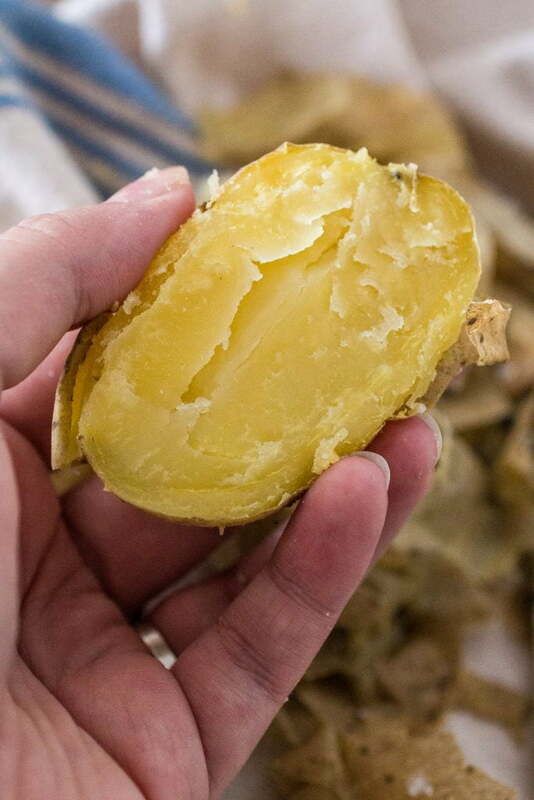 I like to use Yukon Gold potatoes as they have more flavor. However, the gnocchi snobs claim that the Russet potatoes have more starch and are drier than the Yukon variety, therefore better to make soft gnocchi, as you won’t need as much flour to soak the moisture. Again, just ignore that and make your gnocchi with whatever potatoes you have at home. Or, if you have both, practice with both and decide which one you like better. After all, at the end of the day it is all about personal preference, isn’t it? Marco Canora claims that older potatoes are better ’cause they will be drier and starchier. So if you happen to have potatoes that are budding, just use them to make gnocchi! To bake, or not to bake, that is the question. Here is the part when even the snobs disagree. Batali, for example, will tell you to boil the potatoes. However, since we are trying to get rid of the moisture here – less moisture equals less flour – I choose to bake my potatoes (pierced several times with a fork), at a 350F degree oven, on a bed of coarse salt to draw the excess moisture. 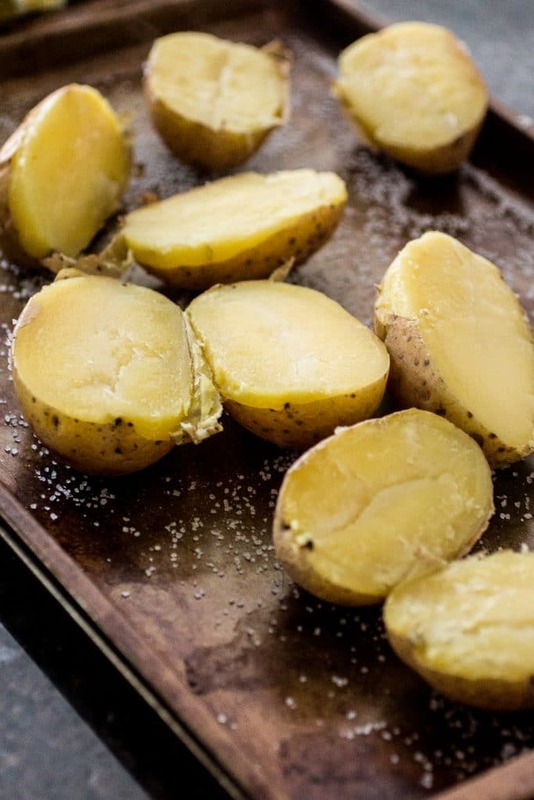 Also, work with your potatoes as soon as they are out of the oven – if you can handle them, of course – as they will be steamy and more water will evaporate from the potatoes. Remember that weird gadget you have in the back of your cabinet, that you never use? Well, time to put that baby to work. 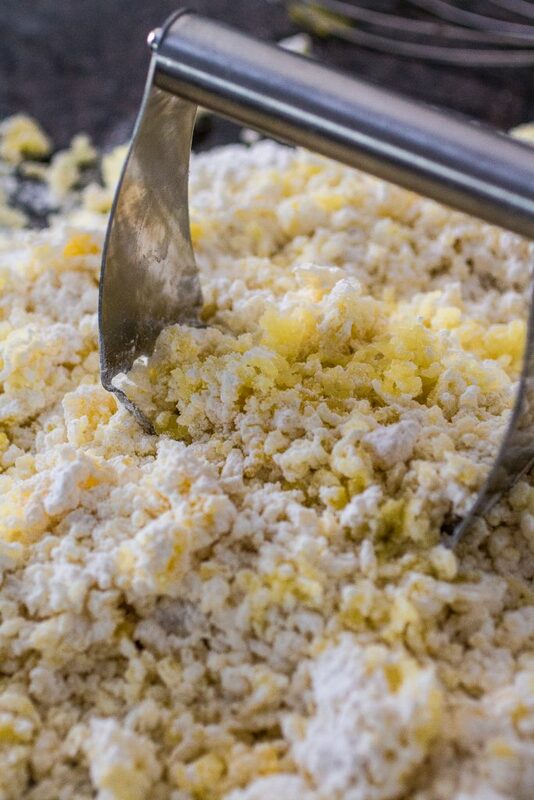 A fine potato ricer will produce tiny crumbles of potato, which is what we want for a soft, light gnocchi. 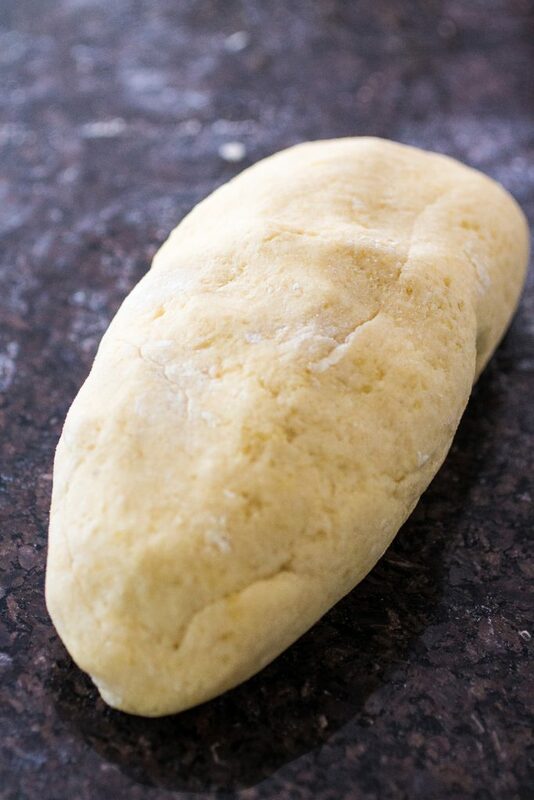 You don’t want big pieces of potato, as the resulting dough won’t be as smooth and easy to roll without breaking. 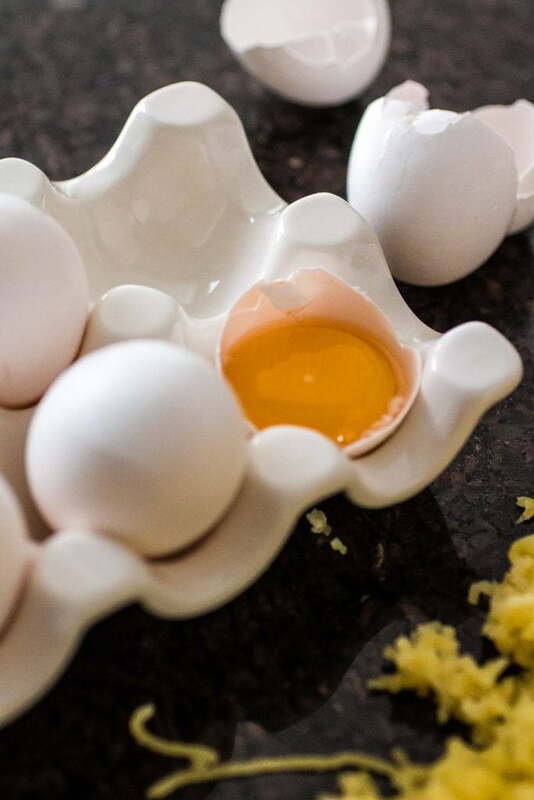 Egg yolks will help you make a smoother dough and the resulting gnocchi will hold their shape better. The snobs, however, claim that gnocchi without eggs are the softest. WHAT KIND OF FLOUR AND HOW MUCH? There is really no right answer here. In fact, every time I make gnocchi, it changes. 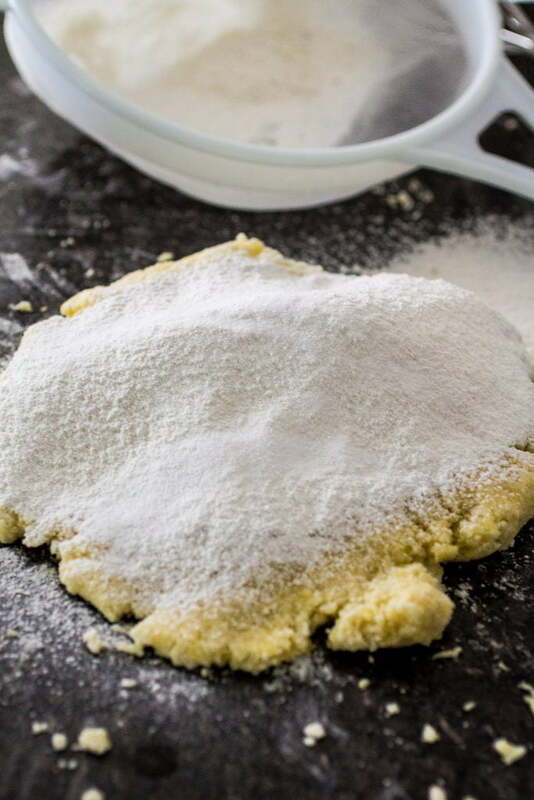 You might need more or less flour, depending on the potatoes and how dry or moist they are. Even the weather can influence how much flour you would need! For this batch, I used 1 and 1/2 cups of flour for 5 potatoes (about 2lbs). I also try to use 00 Flour (low protein content = softer gnocchi) whenever possible, but cake flour is a good substitute. If you only have all-purpose, that will also do! The secret here is to add the flour in parts. Like Canora, I add my flour in 3 parts. The first time I sprinkle 1/2 cup flour (sifted) all over the “mashed” potatoes, which are spread into a single layer on the counter. Then, using a pastry cutter, work the flour into the potatoes, being careful not to overwork it. Next, I add the second 1/2 cup of flour and I repeat the process until all the flour is incorporated into the potatoes. 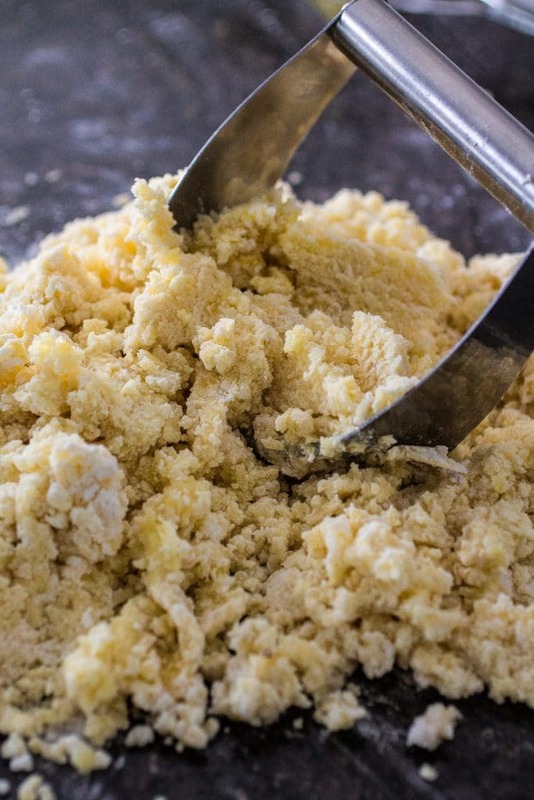 At that point, I let go of the pastry cutter and, using my hands, I form a dough ball and I sprinkle the final amount of flour, adjusting to more or less depending on how much flour the potatoes are absorbing. After that, you fold and press the dough a few times, just until smooth and sticking to your hands and counter. No kneading, as you don’t want to develop gluten, who is the enemy of pillowy gnocchi! Look how nice that dough looks, with all the little air pockets! Oh yeah, my friends, we are on our way to gnocchi nirvana! ROLLING, CUTTING AND, FINALLY, COOKING! The next steps are pretty straight forward. 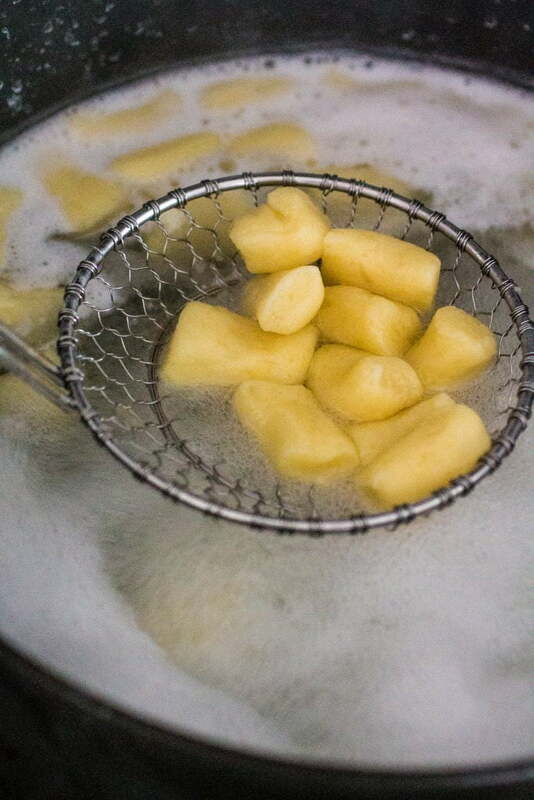 Cook your gnocchi in a pot of salted boiling water until they float. Then, toss them with your favorite sauce. If you’re not using them right away, shock them in ice water after taking them out the pot and store them in the fridge until ready to use (preferably the same day or next day). 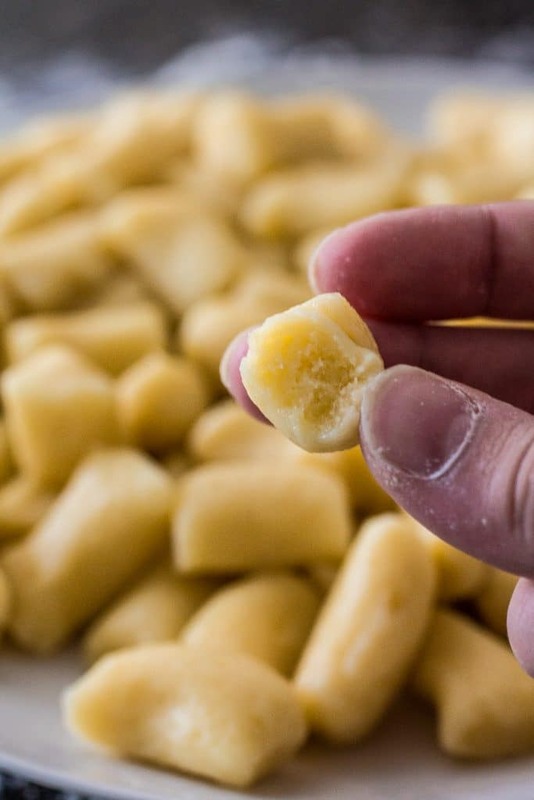 If you want to make gnocchi, but don’t plan on using them soon enough, just freeze them raw. Place the raw gnocchi on a parchment paper-lined baking sheet, making sure they are not touching. Then freeze until they are solid and place in a resealable freezer bag. They will keep well for about a month. When ready to cook, toss them into the boiling water. No need to thaw before cooking! So what do you think? Have I inspired you to dust off the apron and get your hands dirty? 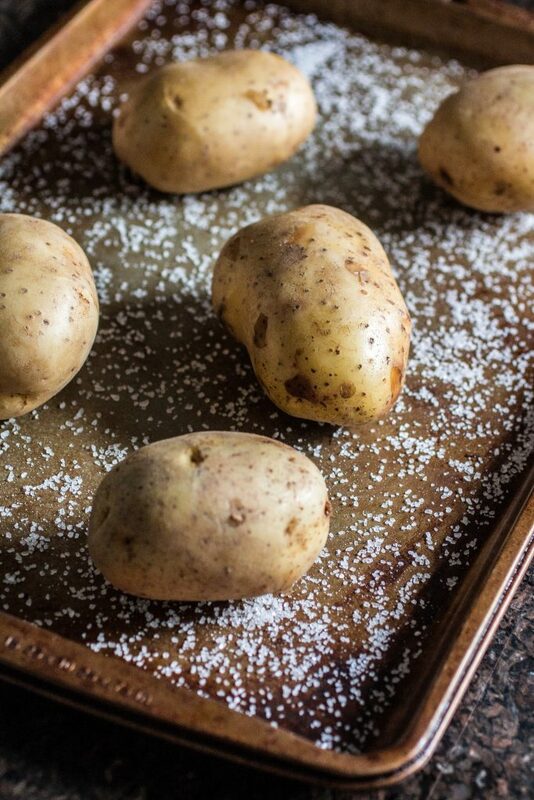 Place the potatoes on a baking sheet layered with coarse salt and bake them for 1 hour or until tender. Transfer the baked potatoes to a working counter and slice them in half lengthwise to release the steam. While they are still hot, scoop the flesh out and, using a ricer, press the potatoes right onto the surface you're working on. Spread the mashed potatoes into a single even layer. Drizzle the single layer of potatoes with the yolks, trying to get as much as the potatoes as you can. Using a pastry cutter, work the yolks into the potatoes, just enough so you don't clearly see the stream of yolks on the potatoes. 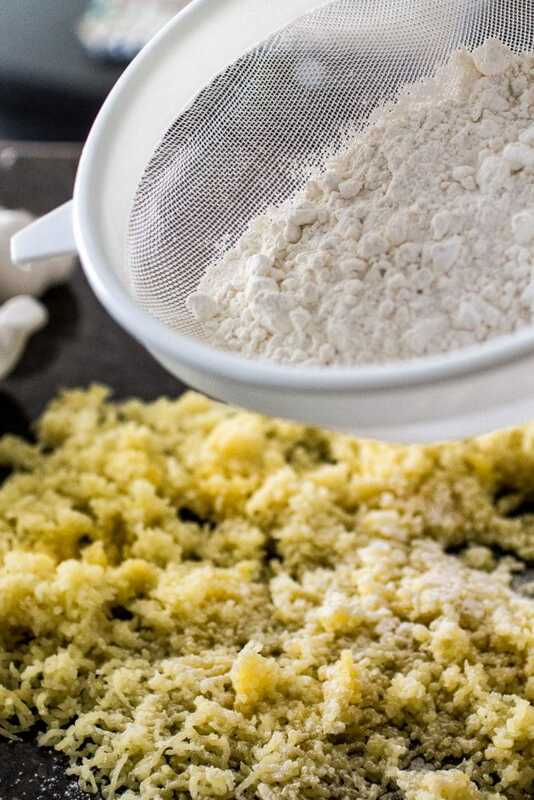 Using a fine mesh sieve, dust the potatoes with the salt and 1/2 cup of the flour and work the flour into the potatoes using the pastry cutter. When you can't see the white flour anymore, add the second 1/2 cup and keep working with the pastry cutter until the mixture is no longer white and all you can see is yellow. Now it's time to gently press the potatoes into a dough disk and sprinkle the remaining flour. Make sure you adjust the amount of flour. Maybe you'll need more or maybe less, just go with your guts! 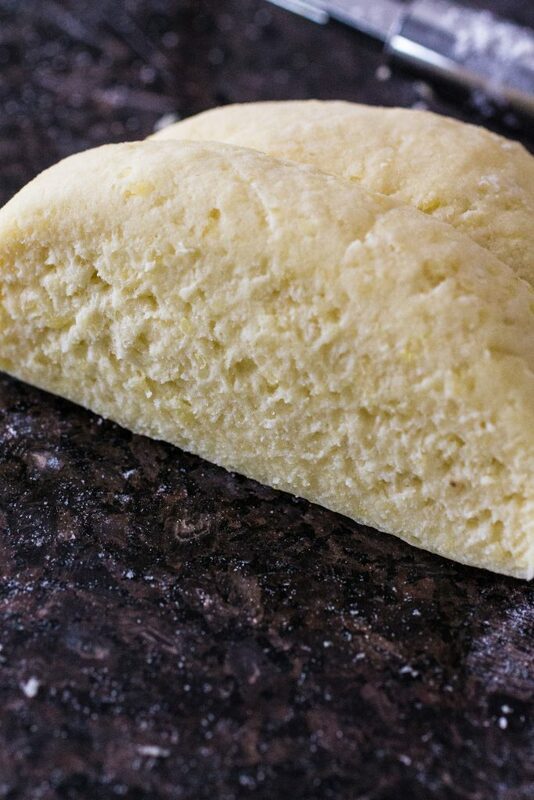 Work the last addition of flour by folding and pressing the dough (no kneading or stretching! ), until the dough is smooth and cohesive, but not overworked. You will be able to tell because the dough will start sticking to your hands and counter. Gently form a large log of dough. Let the log rest until you clean and dust your counter with fresh flour. 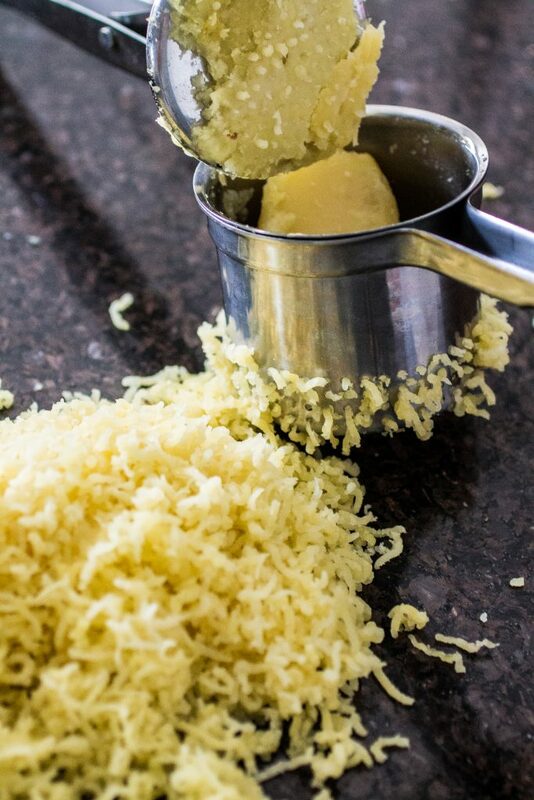 Use a bench scraper to cut the dough into 1 inch slices and gently roll each slice into long thin (about 1/2 inch thick) dowels, using the palm of your hands. Cut the dowels into 1 inch long gnocchi and transfer the gnocchi to a floured area. Bring a pot of salted water to boil. Cook the gnocchi just until they float and, with a slotted spatula, scoop them up and transfer directly into skillet with sauce. * The measures above will vary according to how dry or moist your potatoes are. Make sure you adjust the amount of flour accordingly, so you don't end up with a too-dense gnocchi or a dough that won't hold its shape! « Chicken Cacciatore and a Perfect Pasta Night Giveaway! Wow, such a great post, thanks for sharing Olivia! Glad you did not boil the potatoes! Pinning the recipe to try the recipe! Wow! This is an awesome post Olivia. This is such an amazing recipe. Can’t wait to try. Great step-by-step recipe Olivia!! Gnocchi is my favorite dish and I’ll definitely have to try your recipe! Thanks, dear! I hope you enjoy it! ME TOO! I even talked about it on my next post. It is great for anxiety management!! :) Thanks, my dear! I hope you try it and love it! Hello! I am so glad that I stumbled upon your blog today! This is an awesome recipe. I’m gluten-free, but I think I could substitute a 1-for-1 flour and still get the right texture. I’ll have to let you know how it turns out! Wonderful recipe, Olivia! A light and tasty recipe, perfect for Sunday lunch here in Brazil! Thanks! You have to make it for dad! Awwww! Thank you, my dear! I’m very happy you commented here. Miss you tons!